Texas Group meets with Marty Higgins. Wednesday evening I find a message on my answering machine. It's from Pieter Oosterman. I return the call but get hìs answering machine. He catches me the next day before I go to work. 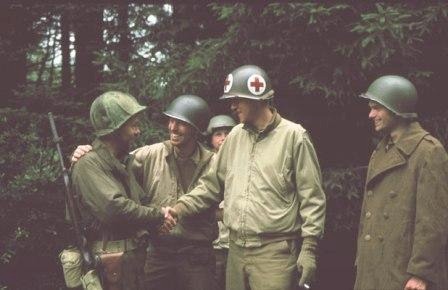 'Frank, remember we wanted to send to Marty Higgins the reenactment picture we did of his handshake after the Lost Battalion was relieved? Well, if we can meet up this coming Sunday in Delft we can hand it to him, personally. He is in the Netherlands right now!' Wondering what would bring an eighty-two year old veteran to the Netherlands we agree to meet at Hotel Leeuwenburg, Delft, Sunday night at 2000 hours. When I get there five past eight my buddies are already gathered round a elderly American who is doing most of the talking. He seems genuinely pleased to make our acquaintance. We all sit down at two tables put together. Marty Higgins freely talks of his war experiences. He has known Pieter for some time now, throughout correspondence and e-mail. And Pieter has shown him the various sights in Holland the past week. 'I'm an emotional guy', he tells us repeatedly, and every now and then he urges us to bring up a lighter subject before it would get too much for him. And as if all those memories of loss and hardship in world war 2 are not enough he also informs us that his wife passed away last year. Still he seems to really enjoy our company and we hardly have to change the subject at all. Just about all of us are in dress uniform, T-patch and all. Marty Higgins joined the National Guard in 1939. Not to become a soldier but to ride horses. At the time most Cavalry units were slowly being changed into mechanized units but Pvt. Higgins actually got to ride horses, in cavalry boots, breeches and Montana peaked hat. As smoking in and around the stables was strictly prohibited because of the fire hazard, he took to chewing tobacco. He got his commission in 1942 and was assigned to a colored outfit; the 10th Cavalry. With these 'Buffalo soldiers' he was sent overseas to North Africa. Now at the time colored soldiers were not yet committed to combat duties, even though Lt. Higgins was sure they would make darn fine fighters, who would do very well in combat. History has since proven him right many times over. At one point he had the choice to either stay with this unit and perform all kinds of non-combatant duties or join the replacement pool for officers. He decided to do the latter, even though it meant leaving his outfit behind. 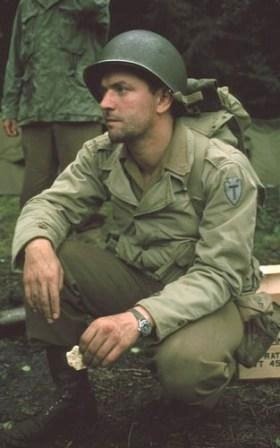 In spite of his being a Cavalry man he was assigned to, or in his own words: 'I was lucky to get', the 36th Infantry Division. For the 36th the fighting in Italy was by now over. The division was training for the invasion of Southern France. He considered himself lucky with the timing of his arrival because it gave him as lieutenant a chance to get to know his new outfit before engaging in combat. A privilege that not every new officer would get in world war 2. Marty Higgins knows of many officers getting an outfit in mid-combat. These people lost guys whose names they learned only from the KIA reports. The division landed at St. Raphael and the drive north began. The 1st BN, 141st Reg. earned The Presidential Unit Citation for the landing operation in Southern France. After hard fighting but with great speed U.S. troops finally reached the Vosges where the German 19th Army decided to make its stand. The fall weather and rugged terrain made things even worse. So relatively close to the Fatherland the Germans put up fierce resistance. But General Dahlquist drove on his men relentlessly. It is my personal opinion that General Patch, commander of the Seventh Army possibly had set his mind on getting to the Rhine before anybody else. That drive led to that fateful October 23, 1944, when Able Company was ordered to set out from Belmont, near Bruyères, to penetrate the German lines across the ridge over Biffontaine and La Houssiere. Lt. Higgins spoke to his superiors of his concern of getting cut off. Still the order had been given, move out along the ridge and that is what happened. Not too much was said by Marty Higgins, on what actually happened up on those hills. Veterans seem often reluctant to talk about actual battle experiences. They are still trying to cope. But we got all kinds of information on rations, uniforms and use of weapons. Marty Higgins does not recall eating too many K-rations. He claims to have gotten by on D-Bars and chewing tobacco. He never wore a winter combat or tanker jacket, but he always admired them. Now for a picture in front of the hotel Cor was only too pleased to lend Marty Higgins his tanker jacket, that he had brought for the occasion. During the Vosges campaign Lt. Higgins wore a reversible parka which he kept until well after the war. Sadly, a few years back he decided to throw that dirty old parka away. I'm sure I saw Pieter cringe when that was told. We learned that GI's hardly ever used captured weapons. It would be a foolish thing to do since GI's when they heard a German weapon be it a "Burp Gun" (MG-42) or "Rat Pistol" (MP-40), they routinely fired in that direction. Marty Higgins also had a very interesting theory about his carbine. He always carried an M-1 carbine with M-8 grenade launcher. He carried two grenades with this. Now of course he knew that an M-1 rifle was much more powerful, but he liked the carbine because with its 15 round magazine you could get a lot of lead flying very quickly. And by the time a real need developed to fire an M-1 he figured there would be plenty lying around. All this sounds perhaps a bit grim but this guy was in combat for a long time all those years ago. And it is hard for us to even try to imagine what it was like. 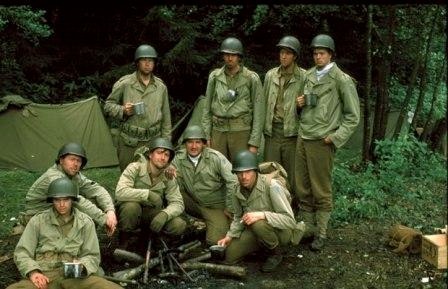 Even after having just seen the movie Saving Private Ryan, of which Marty Higgins said it came a long way in realism. But having to go through the real thing is worse, much worse. And he stated that a Ranger Captain, having fought in Italy, would never paint his Captain's bars on his helmet. They'd be aiming stakes for any German. And of course the movie could impossibly convey the hopeless endlessness of his combat experience. The carnage just went on and on and on. And every moment of every day the fear, the unbelief that you could get through all this alive. And at the same time human nature had you believe that of course it could never happen to you. Other guys got it but not you. When going into combat the first time he decided that if he lost a leg or an arm he would not want to get out alive at all. After two weeks of fighting he decided that if he could get out with just losing an arm or a leg he would consider himself lucky. Another veteran described it in a letter as "two years of non-stop hell". After the Lost Battalion episode the fighting took Lt. Higgins and his Able company further into the Vosges and into the Alsace plains. At Sigolsheim they got cut off again. This time relief could not come in time. After firing everything they had, including German weapons, the only option was surrender. Marty Higgins had contemplated just about everything that could happen to a guy in war but surrender had never been on his mind. Now he had no choice. All men under his command agreed and those alive today still praise Marty and hold him in the highest esteem. As prisoner of war Marty Higgins said he hit rock bottom. His life could not get any lower. He had been hurt when captured, with concussion. Food was in such short supply at one stage that laborers from a nearby slave labor camp felt pity for these POW's. He and others stole potatoes from pigs and ate them raw. During the final, chaotic stages of the Third Reich a fellow officer literally picked up Marty Higgins and so saved him, until finally liberation came and he learned he had been promoted to Captain. After the war he never attended reunions much until he was contacted by Franz Steidl, author of the book "Lost Battalions". And through the T-Patcher, the Fighting 36th Association Newspaper, he got word of the Dutch Texas Group. Just eight months ago he got himself a computer and got in touch with Pieter. Now it dawned upon us that we were the reason he had come to Holland. And he kept saying he was honored to meet us, and we kept saying; 'No, we are honored to meet you!' Incredible.